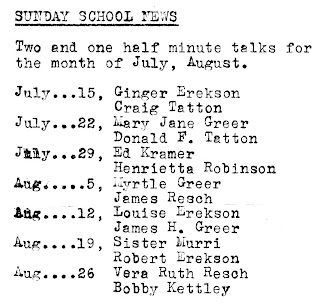 Once upon a time Sunday School was a stand-alone meeting with its own opening exercises. Actually, the truth is that Sunday School was the meeting of choice for many members, and lest they should miss partaking of the sacrament (because they did not attend the sacrament meeting that was held on Sunday evenings), the sacrament was administered and passed both morning and evening. 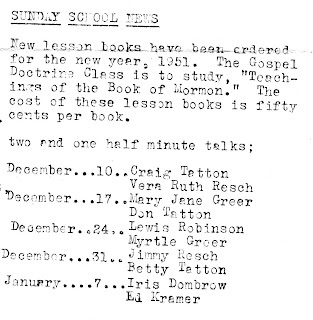 Of course many members today won’t remember any of this because the consolidated meeting schedule (the three-hour-block of meetings instituted in 1980) spelled the demise of the Sunday School opening exercises. Too bad, because with opening exercises went a unique Mormon icon—the two-and-a-half minute talk. You read that right. Not three minutes, not five minutes, but two-and-a-half minutes. Why this prescribed length? Well, remember that Sunday School talks were the Lord’s own training ground for public speaking, and all members of the branch were given their turn, child, new convert, and life-long member alike. Who could be intimidated by speaking such a short time, and to such a small audience? And, on the rare occasions when the two speakers actually managed to speak for 2½ minutes each, the talks neatly added up to five minutes, just the right amount of time for a few brief thoughts before the practice hymn and dismissal to class. (The practice hymn is another casualty of the consolidated schedule.) The exact time was rarely achieved, however. The speakers either sat down after thirty seconds or rambled on for fifteen minutes, and it didn’t matter anyway. 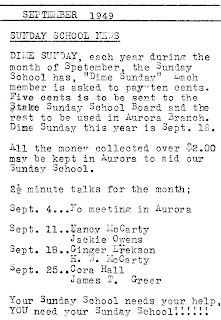 Beginning in September 1949, the assignments for 2½ minute talks were published in the Aurora Branch newsletter. It would be interesting to know if the people were asked ahead of time, or if they learned about the assignment when they read the newsletter—echoes of mission calls issued from the pulpit at General Conference. Here are some of the assignments as published. It appears that a male and a female member were assigned each time, but otherwise there were no age and experience requirements. In the above list from December 1950, Craig Tatton, Vera Ruth and Jimmy Resch were children under 10. Mary Jane Greer was almost 14, and the others were adults. Since I was thinking about Sunday School, I asked my father to help me remember how the program went each week. Here’s what he came up with, and I’ll take his word for it as he was the Sunday School superintendent for more years than anyone can imagine. Did you catch that “Sacrament Gem”? Yet another tradition lost to the consolidated schedule, but more about that another time. Do you ever think they will bring it back...the talks...and the whole opening exercises etc? Time will tell I guess.